Andrew Luck led the Indianapolis Colts to the AFC championship title game by throwing two touchdowns in a 24-13 win over Peyton Manning's Denver Broncos. 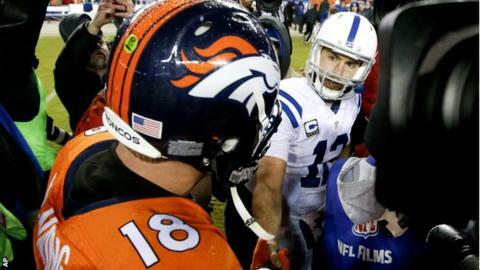 Luck outdueled the quarterback he succeeded in Indianapolis, with Manning limited to one touchdown in the game. The Colts face New England Patriots to reach the Super Bowl after Tom Brady threw three touchdowns and ran in one in a 35-31 win over Baltimore Ravens. Green Bay Packers and Seattle Seahawks will meet in the NFC championship game. This is the first time in 21 years - and only second time ever - that three of the final four teams are quarterbacked by a Super Bowl champion. New England's Tom Brady won in 2002, 2004 and 2005, while Green Bay's Aaron Rodgers (2011) and Seattle's Russell Wilson (2013) have one win apiece. Andrew Luck, of Indianapolis, is the odd man out. Aaron Rodgers battled through pain to rally the Packers to a 26-21 victory over the Dallas Cowboys. Rodgers, struggling with a calf injury, threw two touchdown passes as Green Bay fought back from a 21-13 third-quarter deficit. He passed for three touchdowns and 317 yards for the game. Defending Super Bowl champions Seattle beat the Carolina Panthers 31-17, putting them one win away from a return trip to the NFL's championship game as they bid to become the first champions to retain their title in a decade.